This is the home of the "Stumped?" 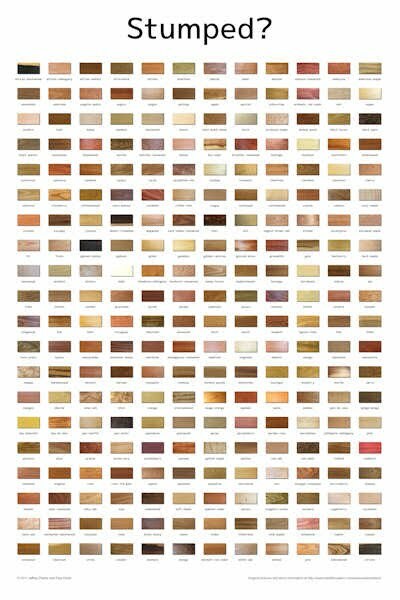 poster, featuring a catalog of original high-quality wood photography all labeled with their appropriate names. Use it as a reference chart, or as the perfect decoration for your woodworking shop. Poster is 24"x36" and printed on 100lb glossy paper. It features 240 high-quality photos of wood labeled with the most accurate/common names. The text at the bottom of the poster reads "© 2011 Jeffrey Parker and Paul Hinds" and "Original pictures and wood information at http://www.hobbithouseinc.com/personal/woodpics/". The price is $25 + $5 shipping/handling within the continental U.S. A 6% sales tax will be added to orders shipped to MI. Orders will be shipped within 5 business days of being placed, and will be sent via USPS First Class Mail (or comparable alternative). If you would prefer a faster shipping method, please contact us with your shipping address and we'll quote you a rate. By default, orders will be shipped to the billing address. If you prefer the order shipped to a different address, please include a note in PayPal when checking out. Upon placing an order, you will immediately receive a PayPal confirmation email from 'Jeffrey Parker'. You'll receive a second email once the order ships. We do ship internationally, but the rate varies by country. I've updated the PayPal button with the correct shipping rate for some countries, but if it shows the cost as $100, this means we don't have a quote yet. Please send an email to [email protected], and we'll research the price and update the cost. Please contact [email protected] for help with any additional questions. The 'Stumped' poster is an original creation by Jeffrey Parker and Paul Hinds. No part of the poster may be copied without permission.